This article is about the philosopher Liezi. For the text, see Liezi. Lie Yukou (Chinese: 列圄寇/列禦寇; pinyin: Liè Yǔkòu; Wade–Giles: Lieh Yü-k'ou; fl. ca. 400 BCE) is considered the author of the Daoist book Liezi, which uses his honorific name Liezi (Chinese: 列子; pinyin: Lièzĭ; Wade–Giles: Lieh-tzu; literally: 'Master Lie'). The second Chinese character in Yukou is written kou 寇 "bandit; enemy"; the first is written yu 圄 "imprison", yu 禦 "resist; ward off", or occasionally yu 御 "drive (carriage); ride (horse); control" (the Zhuangzi claims Liezi could yufeng 御風 "ride the wind"). Lie Yukou was born in the State of Zheng, near today's Zhengzhou, Henan Province. Very little is known of our author beyond what he tells us himself. His full name was Lieh Yü-k'ou, and it appears that he was living in the Chêng State not long before the year 398 BC, when the Prime Minister Tzu Yang was killed in a revolution. He figures prominently in the pages of Chuang Tzu, from whom we learn that he could 'ride upon the wind'. 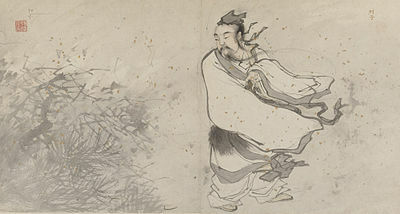 On the insufficient ground that he is not mentioned by the historian Ssu-ma Ch'ien, a certain critic of the Sung dynasty was led to declare that Lieh Tzu was only a fictitious personage invented by Chuang Tzu, and that the treatise which passes under his name was a forgery of later times. This theory is rejected by the compilers of the great Catalogue of Ch'ien Lung's Library, who represent the cream of Chinese scholarship in the eighteenth century. The extent of the actual mischief done by this " Burning of the Books " has been greatly exaggerated. Still, the mere attempt at such a holocaust gave a fine chance to the scholars of the later Han dynasty (A.D. 25-221), who seem to have enjoyed nothing so much as forging, if not the whole, at any rate portions, of the works of ancient authors. Some one even produced a treatise under the name of Lieh Tzu, a philosopher mentioned by Chuang Tzu, not seeing that the individual in question was a creation of Chuang Tzu's brain! Balfour, Frederic H. Leaves from my Chinese Scrapbook. London: Trubner. 1887. Reprint. 2001. Giles, Lionel, tr. Taoist Teachings from the Book of Lieh-Tzŭ. London: Wisdom of the East. 1912. Giles, Herbert A., tr. Chuang Tzu: Mystic, Moralist and Social Reformer. London: Bernard Quaritch 1889. This page was last edited on 18 September 2017, at 13:48 (UTC).